The goal was to produce a generator of audio frequency sine wave signals of the highest possible quality that may be used as a frequency standard for testing all components in the path of the signal. A very thorough specification follows, with the aim to increase the usefulness of the signal generator for sound engineers. In the quest to create "the perfect wave", the floating point calculations that produce the sine wave employ 80 bits of internal precision. Each signal generated is a perfectly symmetrical series of whole waves so as to end up with a negligible DC component. Whatever DC remains is removed, so that for any given frequency of 10 seconds duration or less, the DC level is guaranteed to be 0. In the case of 16 bit samples, dithering may add a minuscule amount of DC. DC correction is not applied to signals of a duration greater than 10 seconds. multiples of the period to eliminate speaker pops and clicks. (See image above). such that they add up to at least the duration requested in seconds. of the resulting file to about 16 gigabytes. to the final 16 bit output sample size. A separate dithering signal is applied to each channel. File are generated in the form of stereo Window's RIFF PCM Wave format files. samples of silence (depending on how much room was left in the buffer). The sweep generators employs a swept sine wave function. In the case of the Linear Sweep, an equal phase delta is applied to each sample, whereas for the Logarithmic Sweep, a log base 2 function ensures that there are an equal number of samples per octave. 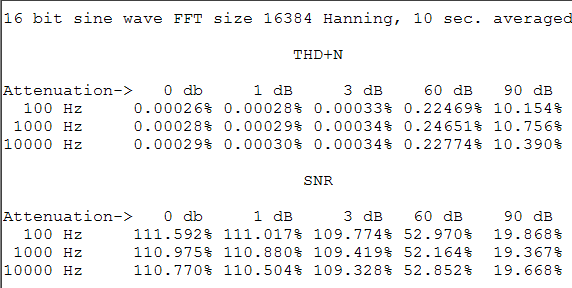 The difference can be seen in an FFT of the averaged signal. The magnitudes of a linear sweep will draw a straight line across all bins within the sweep range, whereas the magnitudes of a logarithmic sweep will slope down to the right by 3 dB per octave. This is because when samples are all averaged together, each succeeding octave has half the number of samples per frequency delta than the previous, and therefore half the energy. This is only an illusion however, in the sence that as we hear each sample played, it's amplitude is equal to all others and therefore the magnitude of the frequency component is also equal.The sweep generators do not employ DC correction. (Significant DC can accumulate in a sweep signal but attempts to remove it would result in unacceptable distortion.) It can sweep up or down. The minimum and maximum frequencies and attenuation values allowed are the same as for the sine wave generator. The minimum sweep duration is 0.1 seconds. Duration is rounded up to the nearest multiple of 128 samples. A linear taper of 128 samples is applied to the end of the signal. During taper down, the frequency is held at the ending frequency requested. The default setting sweeps through 6 octaves from C2 to C8. Since version 1.06 of the Audio Test File Generator a Gaussian noise generator for white noise was employed. The pseudo-random number generator employs the "Mother-Of-All" generator invented by George Marsaglia and provides an excellent even distribution. The code for this can be found at http://www.agner.org/random/. The overlaid Gaussian window is a codification of the Box–Muller transform in its basic form to provide a zero-centered normal distribution of the samples. The output was thoroughly tested to ensure uniform distribution with a Gaussian curve. The pink noise generator employs an algorithm by Andrew Simper of Vellocet, a C++ implementation derived from the code provided by the following people mainly from the music-dsp mailing list: Allan Herriman, James McCartney, Phil Burk and Paul Kellet and the web page by Robin Whittle: http://www.firstpr.com.au/dsp/pink-noise/. 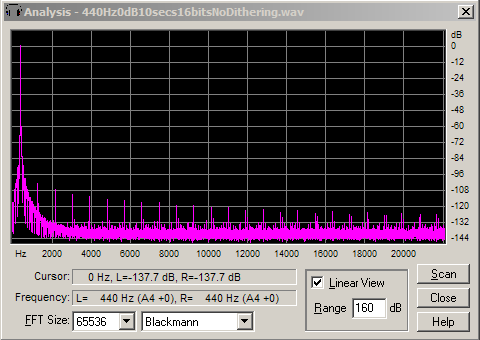 Maximum signal level is nowhere near 0 dB, since considerable head room is given to ensure there can be no clipping. Determining the signal level of noise is problematic because of its random nature. However, if you employ attenuation you can be assured of accuracy of relative signal levels over the long term. Its "peak" frequency is below 1 Hz, a thing you can verify by averaging a 120 second file using a very large FFT size. 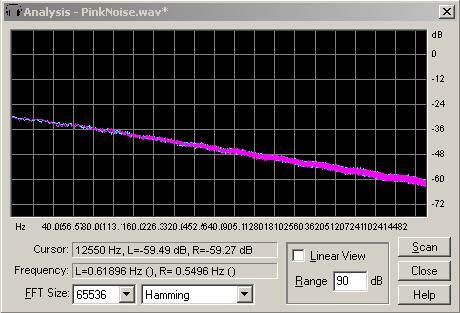 Warning - pink noise contains frequencies below the range of hearing that may damage your speakers at very high levels. Turn down the bass if you want to pump up the sound, or watch your speaker cones for excessive movement.